If you’re after a Serato controller for under £1,000 and covers a lot of bases, you can’t really go wrong with the SX3. Jogwheels feel great for their size. Serato Flip and Pitch N’ Time included. Color FX could get old quickly. Pioneer DJ’s DDJ-SX line debuted back in 2012, and has arguably retained the crown of being the highest-quality, and most powerful Serato DJ controller available for under a grand. Version 3 arrived earlier this year, further refining the already winning formula. The DDJ-SX3 looks very similar to its predecessors. Again, the controller is small enough to transport pretty easily, but with its sturdy chassis and aluminium top it’s also rugged feeling, and you’d expect it to tolerate regular club use without issue. The jogwheels are small, but responsive and sturdy, with a feel not dissimilar to those on Pioneer’s CDJ line. Each has a central display with cue point info and countdown timer, a nice touch for a relatively compact controller. The DDJ-SX3 is four-channel. 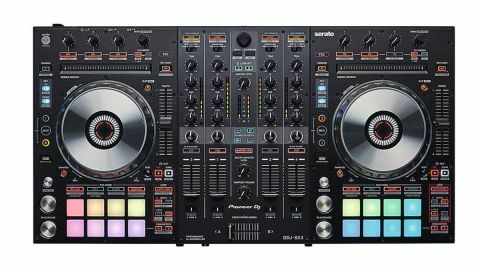 Each channel of its central mixer can be switched between digital inputs from Serato DJ or analogue RCA, and the control decks can be flipped to control up to four Serato decks simultaneously. As a result, the SX3 can act as a hub/mixer for four digital decks, four external players or any combination of the above. The SX3 comes with vouchers to unlock Serato’s Flip and Pitch N’ Time add-ons. The former allows users to make on-the-fly edits using sequenced cue points, while the latter lets users adjust the pitch of a track independently of its playback speed, and lets hot cues be triggered at a variety of pitches. All of this can be controlled from the SX3’s front panel, with the bright, responsive performance pads below each jog wheel handling triggering and performance duties. Performances can be further spiced up with control over two levels of effects, from Serato’s built in effects section and the SX3’s own onboard Color FX. The latter of these are four quick punch-in effects, offering various forms of dance music-friendly builds or sweeps: Echo, Jet, Noise and Filter. While these could get old pretty quickly if overused, they do add a nice, quick way to add interest. For slightly deeper effect use, Serato’s digital processors can be controlled via a trio of rotaries above each jog wheel. The main upgrades for version 3 come on the connectivity front. Here we get three mic inputs - two on the rear, as with the SX2, plus a new front panel mic in with its own dedicated level controls. The mic inputs get their own effects too, with reverb, compression, EQ and a low-cut filter available. The SX3 also adds a second USB input, which allows for multiple Serato DJs to transition between sets without the need to stop and reconnect laptops. These updates aren’t massive, but they do refine what was already one of the smartest DJ controllers in the sub-£1,000 bracket. The extra connectivity is useful for small clubs, bars and regular parties/ events. Definitely up there with the best digital DJ solutions on the market right now.